A man was arrested a short distance away. The robbery took place in Ballymun yesterday evening. A MAN WAS arrested in Ballymun yesterday after a thief attempted an armed robbery of a shop when two armed garda detectives were inside. 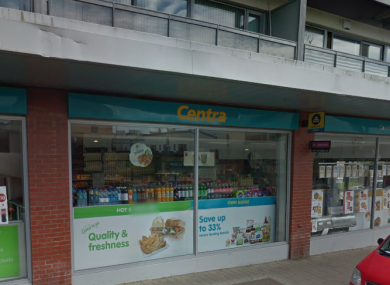 The robbery happened at the Centra store on Coultry Road at about 7.10 pm yesterday evening. The assailant entered the store and threatened staff with a suspected firearm before taking cash from a till. Two armed detectives were in a different part of the store when the robbery took place and they confronted the man who then fled on foot. A follow-up search was then carried out a short distance away where a man was arrested and a sum of cash was also recovered. No shots were fired during the incident and nobody was injured during the robbery. The man is currently being held at Ballymun Garda Station where he can be held for up to 24 hours. Email “Ballymun raider attempts armed robbery while armed gardaí are in store”. Feedback on “Ballymun raider attempts armed robbery while armed gardaí are in store”.